Washington – An unidentified group of hackers broke into computers used by members of the United States Congress and their staffs, and while in the system managed to balance the federal budget, according to several FBI agents and other law enforcement officials. No one has yet taken responsibility for the attack, which resulted in what many economists are hailing as a “sensible, balanced budget,” with no other apparent damage to government computers or data. If adopted, the budget could put an end to a bitter fight over whether or not the United States should raise the so-called “debt ceiling,” in addition to solving several other thorny budgetary and fiscal issues. Computers at the White House appear to be unaffected, as do those at the Department of Defense and the State Department. The budget that the hackers propose, according to the FBI agents and other law enforcement officials, includes a large tax increase for the wealthiest Americans and cuts in defense spending. It also includes the closing of many tax loopholes used by multinational corporations in order to avoid paying their full share of income tax. The plan for the closure of tax loopholes was included in a supplemental document which laid out a re-envisioning of the U.S. tax code. There was no official reaction from the White House, but rumors were swirling around Washington by late Wednesday afternoon that President Obama had read the budget and was delighted with it. 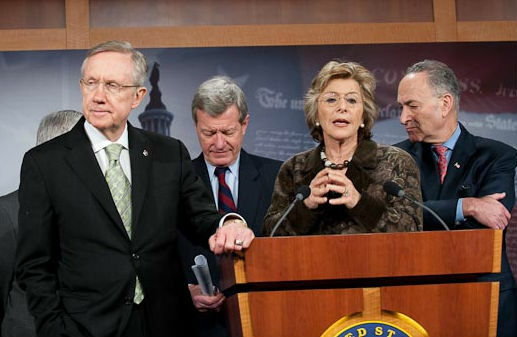 Senate Majority Leader Harry Reid led a press conference that featured other prominent Senate Democrats. The senators applauded the budget, while at the same time bemoaning the apparent ease with which the hackers were able to access what are supposed to be some of the country’s most secure computer systems — those belonging to many of the highest ranking members of its own government. Meanwhile, at his own press conference, House Speaker John Boehner harshly criticized the budget put forth by the hackers as “dead wrong,” and said he sincerely hopes the president will reject it.